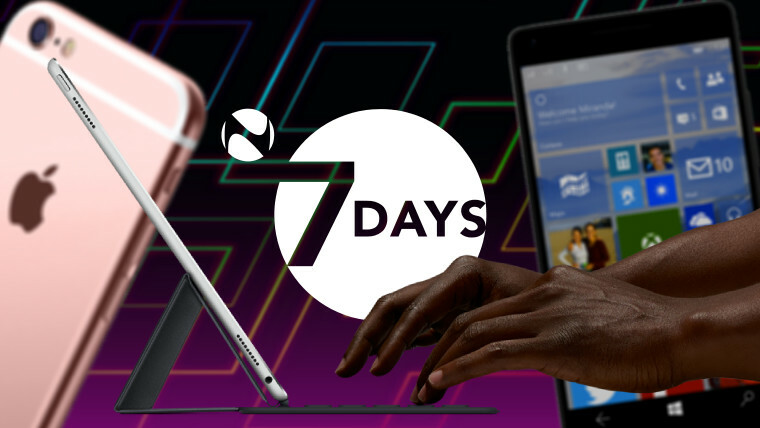 7 Days is a weekly round-up of what's been happening in the world of technology - written by Neowin's editors with a dash of humor, a hint of exasperation, and an endless supply of (Irish) coffee. Here's a especially edited version for TechSpot readers taken from the full article. We anticipated that this week would be a busy one across the tech world, and it certainly didn’t disappoint. But not everything turned out as predicted, and there were one or two surprises. As ever, 7 Days is here to make sense of the week’s top stories for you – so grab a glass of something delicious, sit back and enjoy the journey. Rumors of a larger iPad have been swirling almost since the original model launched in 2010. But at its event on Thursday, Apple unveiled the iPad Pro – a device that appears to draw rather a lot of inspiration from Microsoft’s Surface Pro line. Indeed, Apple’s new 12.9-inch tablet starts at the same price ($799), and also comes with an optional Smart Keyboard cover ($169 – nearly $40 than Microsoft’s), and there’s even a ‘Pencil’ stylus (an optional $99 extra, whereas the Surface Pro 3’s price includes the Pen). The iPad Pro features no mouse support though, so all interactions rely on touch, or the use of the optional Pencil. Nonetheless, Apple was keen to tout the productivity credentials of its giant tablet – and, somewhat unexpectedly, it brought Microsoft on stage at its event to show off its Office software running on the iPad Pro. By the way, if you want to see know how the iPad Pro compares with Microsoft’s Surface Pro 3, be sure to check out our Specs Appeal showdown, comparing the two devices on paper to see how they stack up against each other. Bear in mind, though, that the Surface Pro 3 is now over a year old – and a new version will be unveiled in just a few weeks’ time. Meanwhile, Microsoft India has been talking up the Windows 10 Mobile devices that will launch there in the coming months, with full support for the country’s 4G LTE networks. Microsoft also said this week that “Lumia with Windows 10 [is] set to reinvent business productivity”, and highlighted examples of the benefits that its new OS offers to corporate customers. New photos emerged of Acer’s new flagship-class Windows 10 Mobile device, the Jade Primo, which will feature a Snapdragon 808 processor, 5.5-inch Super AMOLED display, 21MP camera and more. However, hands-on impressions from the site that published those photos suggests that the new handset may not feel like much of a flagship. Serial leakster @evleaks revealed details of a new Windows 10 Mobile handset on the way from Alcatel OneTouch, believed to be called the ‘Fierce XL for Windows’. Despite apparently targeting the entry-level of the smartphone market, it seems the device will feature some pretty impressive specs. WhatsApp updated the beta release of its hugely popular messaging software this week, adding support for Windows 10 Mobile, along with some other new features. But a popular feature that began on Windows Phones will soon be available on another smartphone platform: Cyanogen OS. Microsoft’s digital ‘personal assistant’ has already made the leap from Windows Phone 8.1 to Windows 10, with a beta now available for Android, and a release on the cards for iOS too. But Cyanogen’s CEO said this week that Microsoft is already working with his company to ‘deeply integrate’ Cortana into Cyanogen OS, essentially make it a part of the operating system. This would be in stark contrast to the Android version, where Cortana is downloaded as an app with a few ‘hooks’ into the OS. It’s now been one month since the last Windows 10 Mobile Insider Preview, build 10512, was released – and given that the OS is now weeks away from launch, and still less than stable, that’s a little bit alarming. On Wednesday, Microsoft’s Gabe Aul hinted that new build 10536 was a candidate for release, and on Thursday, he asked the Insider community if it should be released, albeit with a known Store-related bug. The community responded, and Aul said it would be released on Friday. However, on Friday, he revealed that Microsoft had discovered a show-stopping last-minute bug in 10536, which would prevent future builds from installing correctly. So, build 10536 has now been scrubbed, but a new build – already being tested internally – should arrive next week. However, it appears that some users may have received build 10536 by mistake. Neowin reporter Muhammad Jarir Kanji delivered his first impressions of the new Skype Universal app experience on Windows 10 Mobile this week. Microsoft is attempting to provide an augmented Skype experience in the new OS, integrating Skype-related tasks into standalone Phone, Messaging and Video communications apps. Details emerged this week of new UI changes and tweaks, including revised animations, which are expected to appear in the next major update for Windows 10 PCs, known as ‘Threshold Wave 2’. One feature that some Windows 10 users continue to mourn the loss of is Media Center, which is no longer supported in the new OS. However, if you just can’t live without it, there is a way to reinstall it – unofficially, of course. Plenty of new Windows 10 devices have been unveiled in recent weeks – from high-end all-in-ones and mighty gaming notebooks, to smartphones, pocket-sized mini-computers, and even a new modular PC. But have any of them caught your eye? We asked our readers if they’re planning to buy a new Windows 10 device – join in the discussion, and have your say! Windows 10 is now pre-installed on Microsoft’s Surface Pro 3 in the United States, where students can currently purchase the device with up to $300 off its regular price. And in yet another surprise announcement this week, Microsoft revealed that Dell, HP and other partners will soon begin selling its Surface Pro tablets to their business customers, as well as offering their own third-party support for the devices. Notably, the press release also appeared to offer quite a strong hint about when we can expect the new Surface Pro 4 to go on sale. But while Dell will be selling Surface Pro tablets, it looks like it’s also building a Surface competitor of its own, featuring some pretty high-end specs. The XPS 12 tablet will reportedly feature Intel’s latest Skylake processors, up to 10 hours of battery life, backlit keyboard with precision touchpad, and a 12-inch display with 4K/Ultra HD (3840x2160px) resolution. And Dell is apparently building a new version of its Venue 8 Pro tablet too, which will launch with Windows 10 onboard. Featuring an 8-inch Full HD/WUXGA (1920x1200px) display and optional 4G LTE connectivity, as well as stylus and Windows Hello support, the device will likely be aimed primarily at business customers. Microsoft will soon invite the seven million Insiders who have been testing Windows 10 to try out new enterprise features in the OS, ahead of their general release to its corporate customers. Microsoft also revealed this week that Office 2016 – which it released for Apple’s Mac range in July – will officially launch for Windows on September 22. Sadly, Microsoft still hasn’t revealed an exact launch date for its new Xbox One user experience, powered by Windows 10 – but the company did say a few days ago that it will roll out to those on its Xbox Preview program “over the next couple of weeks”. As our journey through the week’s news comes to an end, be sure to check out our review of the Tronsmart Ara X5. Neowin’s Timi Cantisano put the low-cost Windows 10 mini-PC through its paces, and found that the device isn’t ideally suited to work, “but excels for play”. Stay tuned to Neowin in the coming days, as Microsoft (hopefully!) rolls out its new Windows 10 Mobile Insider Preview. We’re likely to hear about more new Windows 10 devices on the way, and perhaps a little more on the new Nexus flagship phones that will be announced later this month. With the rollout of Apple’s iOS 9 and watchOS 2 on Wednesday, September 16, and the usual mix of other rumors, revelations, official announcements and unofficial insights, it should be another big week across the tech world.